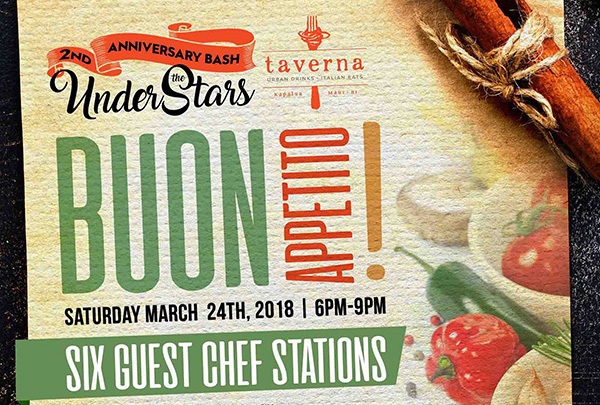 Maui, HI – March 5, 2018 Taverna will be celebrating their second anniversary in style with an “Under the Stars” Anniversary Bash to be held Saturday, March 24, 2018, from 6:00pm – 9:00pm. Guests in attendance will enjoy six guest chef stations, Italian wine stations, craft beer selections and anniversary craft cocktails. The event to be held at Taverna, will benefit the Maui Culinary Academy. Guests can sample the culinary delicacies of chefs including: Gary Johnson, Hana Ranch; Mijin Kang, Nattokimchee Maui Private Chef; Takuya Toride, Nattokimchee Maui Private Chef; Kevin Laut, Outrigger Pizza; Ces Jocson, Taverna; Chris D’Agostino, Cow Pig Bun; and Courtney Galarita, Honu Seafood. Live music by Kelly Covington & Friends will create the perfect ambiance for gathering with friends during this fundraising event. “We have found a winning combination in the partnership between myself and Chris Kaiwi that allows each of us to utilize our strengths which offers Kapalua the ultimate dining experience ,” stated Chef and Partner Roger Stettler. Those wishing to attend can contact Taverna at 808.667.2426. Tickets are available for $98 per person and attendees must be 21 years or older. For more information on Taverna, visit www.tavernamaui.com.